The department of Salto is in the northwestern region of Uruguay, with Salto City as its capital. Its location along the left bank of the Uruguay River makes it a centre of trade between Rio Grande do Sul in Brazil and Concordia in Argentina. The suburb of Pueblo Nuevo in the capital city has several large shipyards. Salto is a fertile agricultural region that produces an abundance of crops and provides grazing grounds for livestock. It is also a popular tourist destination thanks to its many hot springs. Salto City is the second largest city in Uruguay and the capital of the department of Salto. 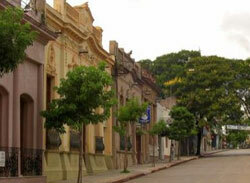 It is a quaint city of picturesque colonial houses and citrus farms along the Uruguay River. The river itself offers a scenic riverbank that extends from Salto Chico in the north to Arenitas Blancas in the south. Along this route, you could see charming waterfalls for which the city was named. The city’s main tourist attractions are its hot springs, especially the Termas del Arapey and the Dayman Thermal Springs. Their waters are not only ideal for relaxation, but their high salt and mineral content provides therapeutic relief for aching joints and muscles. Both of these hot springs have hotels and other tourist accommodations in their immediate vicinity, with swimming pools, tennis courts and other recreational facilities. Also available are multidisciplinary teams of doctors for visitors requiring special treatments. Another popular site in Salto City is Calle Uruguay, an entertainment hotspot with its many nightclubs, restaurants and bars—all the fun for about 30 to 50% less the cost in upscale cities like Montevideo and Punta del Este. It also has its own shopping district, comparable to Montevideo’s prestigious shopping centres. Other interesting sights here are the Salto Grande Dam and the Salto Grande Bridge on top of it, linking the city to Concordia, Argentina. Those looking for colonial-style houses should check out the properties for sale in Salto City. Real estate near schools, the business district of Calle Brasil, and parks and plazas command higher prices than those in working-class neighborhoods.